Why are poppy seeds so good and healthy? Poppy seeds are my latest discovery in La Longuera's shopping mile. Fruteria M.Carmen has sold them for many years. In the past, a friend was searching in vain for the seeds all over Tenerife. She wanted them for her bakery and cafeteria. Both the yeast cake as well as the Christmas poppy cake are very healthy. There is a stall which sells poppy pastry in the entrance of the Martianez mall in Puerto de la Cruz. Do poppies grow in Tenerife ? 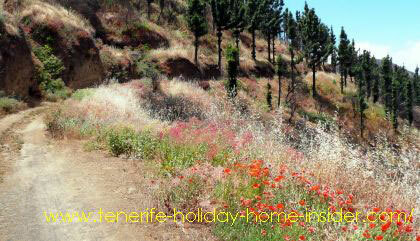 Discover Tenerife flora of a field of red poppies (Papaver rhoeas) which was captured near San Juan de los Llanos. These medicinal flowers also grow wild in the nearby Charcos de Erjos near el Tanque as well as in other humid spots of Tenerife where soil is sandy, has decomposed matter, such as in forests with good drainage. However, it's unlikely that enough seeds of poppies are around on the island to allow for a proper production. Wholegrain seeds are preferred, as they are also less likely to get rancid. The medicinal herb Papaver somniferum whose poppy seeds are so good for you has been known for thousands of years in China. 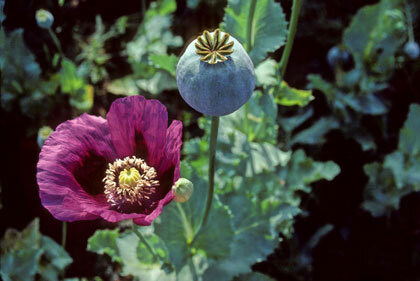 There, poppies are also cultivated to produce Opium. Opium pipes for smoking it are part of this ancient Chinese tradition. It's used in the pharmaceutical industry worldwide for soothing extreme pain, although it is a highly addictive natural 'Narcoticum'. Can you get addicted by seeds? Narcotic opium doesn't derive from poppy seeds. Contrary to the beneficial acids, the 20 alcaline substances, which compose opium exist in tiny amounts in poppy stems, leaves and mostly in its half ripe seed capsules. They are virtually milked by inserting a slit into the seed pods. A white sticky substance is extracted from them. However, the poppy seed cultivars of the European Union don't have addictive properties any more. They were genetically crossed and altered, long before plant genes were scientific evidence. This is produced all over the world, except in tropical regions. Only buy virgin seed oil made from poppies which has been cold pressed below 40 degrees Celsius. The blue poppy of frost prone regions of Tibet in the Himalayas is the most famous. Red, white, orange, yellow and purple varieties of the flower exist in other global parts. Altered medicinal properties of hybrid seeds of poppies? Poppy cake is part of very healthy cake, as seeds provide beneficial fiber. They are so good for the colon. Half of the shown pastry seems to be poppies, as the photo reveals. By the way, there seem to be endemic poppies in Macaronesia where Tenerife is part of. In the following Wikipedia page on poppies even a Papaver Berbera which is indigenous to the North African Berber mountains has been listed.